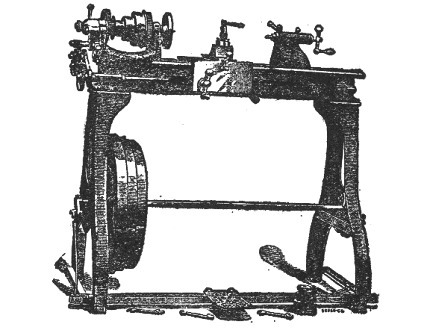 By way of illustration of a piece of work that represents a number of lathe combinations, I will take the fitting of a saw shaft for our common wood saws. First place the balance wheel in the lathe chuck, being sure to get it in the center, so that when the hole is drilled in the wheel it will be in the exact center. Take a drill a sixteenth of an inch smaller than the hole to be made, and drill out the hole. Use the inside boring tool to make the hole the desired size. Turn a smooth face on the hub of the wheel where it comes against the box; then the wheel is ready for the key seat. To cut the key seat in the wheel use a key-seat chisel the same size as the milling wheel used to cut the key seat in the shaft. Next take one of the saw collars; put it in the chuck, being careful to get this in the center also, with the widest side next the chuck, and drill a hole in it the same size as the hole in the saw. Turn off the end of the collar to get it square. Prepare the other collar in the same way. Now cut the shaft off the length wanted, and turn one end to fit tightly into the balance wheel. Turn off a place next to where the wheel comes for the bearing or box. Now turn the shaft around and fit the other end for the collars. The collar that goes on the inside or side next the bearing should be shrunk on. To do this leave the shaft about one sixty-fourth of an inch larger than the hole in the collar, then heat the collar to a red heat, and slip it onto the shaft. It should not be driven very hard, or it will break in cooling. Let it cool of its own accord. When nearly cool it can be put into water and cooled off. The next step is to true up the inside of the collar, leaving about one inch of surface to come against the saw. Now turn the shaft down to the size wanted for the thread, either 1 inch or 1 ? inch, then with a cutoff tool about ? inch wide, cut in next the shoulder the depth of the thread. If there is a die and tap handy that will be the quickest way to cut the thread, but if not handy then use the lathe. Now screw the nut on and turn off the inside of the nut. For fitting the loose collar there should be on hand a shaft about 14 or 16 inches long, turned a very little tapering; then drive the collar onto this shaft and finish it up. When ready put this collar into place on the saw shaft and screw the nut up tight. Now smooth off the outside of the collars for loops. Cut the key seat in the shaft and key the balance wheel on solid, being careful to get the distance between the wheel and the saw collar the exact distance between the outside of the boxes.